Oh, the thrill of Halloween… of bringing to life a favorite character through costume and who could forget… the intoxication of sugar! Its magical watching kids transform into a fairy princess or a superhero who comes to save the day. The pretend play that accompanies an animal costume as a child roars and prowls through the neighborhood collecting candy is adorable. But what do you do if rain lurks in the forecast? Since I know my boys anxiously await the fun Halloween holds for them, I want to make sure we have a backup plan. One year we had to use it because of weather, another year because of a sick kid. These Trick or Treat alternatives have come in quite handy and have even been fun additions to our Halloween parties! Maybe they can scare up some fun for your family too! Your local YMCA. They may have a night of Halloween games, crafts, songs, and Trick or Treating although this may require an advanced RSVP and a small fee. Local churches. Many churches may hold a Hallelujah Night (God-honoring activities, games & snacks), Trunk or Treat, or a movie night. An extra perk of this is the costumes are required to be child-appropriate. Home Depot, Lowe’s, or Menards. It may vary from store to store, but our local Home Depot did a huge Trunk or Treat day Saturday with free hot dogs, sub sandwiches, pizza, cookies, and juice. Some stores will do in-store Trick or Treating on Halloween too. Contact retirement homes and nursing homes in the area to see if they have a Halloween time to bring in your little ones for a visit. We have done this the past couple years and it is such a treat to both the kids and residents. Check out my post Fall & Holiday Kid-Friendly Service Projects for tips on how to make this a successful visit. Pumpkin decorating. So you’ve carved pumpkins, but have you decorated any? Grab a few at the grocery store or a pumpkin stand and raid your art supplies! Let your kiddos get creative on what they want to use for decorating! As long as you have glue dots (or a double sided adhesive) and paint, you should be good! We used sponge dobbers, gems, buttons (which we adhered with scrapbook tape), and fabric paint for the spider web pumpkin. 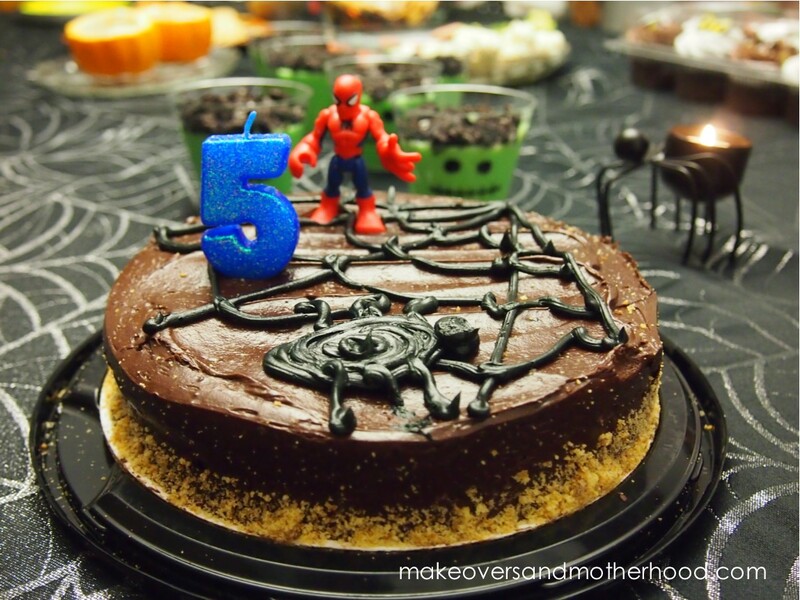 With my oldest son’s birthday being a week before Halloween, we combined his 5th birthday with a Halloween party to and hosted a Halloween Birthday Bash. There are oodles of fun Halloween treats on Pinterest if you want to get creative at home, but I’m all for letting the bakery do it for you to make it easy! In this case, I purchased Halloween cupcakes and then a small 9-inch cake for the birthday boy which the bakery quickly drew a spiderweb and spider on. 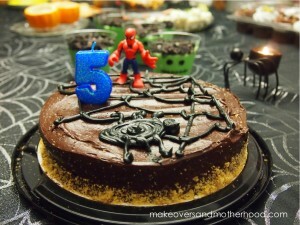 It went with both the Halloween theme and birthday boy’s Spidey costume! My quick & easy tip for if your child is crazy about a certain character or decoration… buy icing pens and decorate your own cake. Gloriously Made’s Frankenstein Pudding Cups are always a Franken-fine Halloween treat. Vanilla or Banana Cream pudding, a few drops of green food coloring, crushed Oreos and you’ve got a monster of a hit! Make Spark Recipe’s Halloween Mummy Bread (Pizza Toast) and wrap up a good meal! 20 Halloween Dinners for Kids can be found at Life with the Crust Off for even more spook-tacular food ideas! 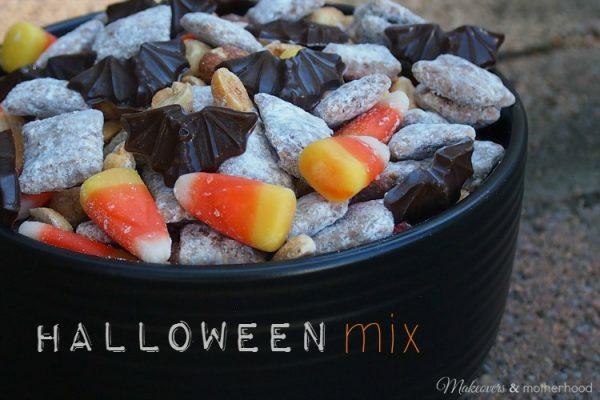 Get shakin’ and make some Halloween Mix… puppy chow, chocolate bats, and more! Do a Critter Hunt. This is especially fun to do in the dark. Give your kiddos a flashlight and hide goodies (plastic bugs, spider rings, fruit snacks, candy) around the room for your kids to find. It’s like Trick or Treating at home! Put together Halloween sensory buckets. Large seeded grapes in water. No one squeezed hard enough to pop out a seed though or really make it slimy. Make an obstacle course in your house or make a “fun house”! Try covering the floor of a small room in your house in bubble wrap and fill the room with black balloons. (I chose our bathroom to keep the balloons confined in a small area.) Leave the lights off and just add the glow of candlelight or a night light… just enough light that they don’t get scared or hit something or someone. You want them to be intrigued and have those nervous giggles as they enter the “fun room” and explore. When we did this, the kids were surprised and thrilled that the floor beneath them was popping. Just as I hoped, the kids broke into a bubble wrap popping dance. Balloons were flying, kids were giggling… it was great! Playing some fun Halloween songs like “Monster Mash” might make the dance party last longer. Check out the Easy Indoor Halloween Obstacle Course from Lalymom! Looks like lots of fun! Craft time is always a boo-tiful thing with children! So pull out the googly eyes and craft supplies and let your kids create! 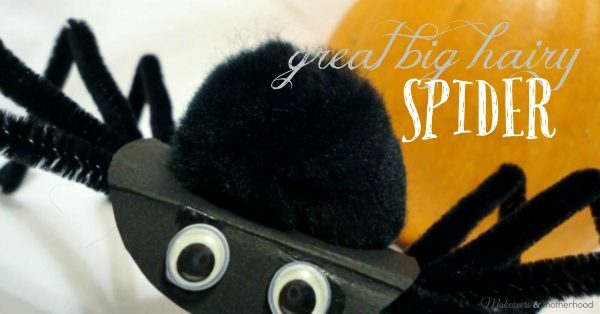 One of our favorites is the Great Big Hairy Spider Craft! We’ve only made the spiders once, but we sing the song year round and keep our spiders in our Halloween box so we can use them in our decorations every year! Don’t let a little rain make for a gloomy Halloween! Make a memorable indoor family Halloween celebration your kids won’t soon forget! What fun ideas! 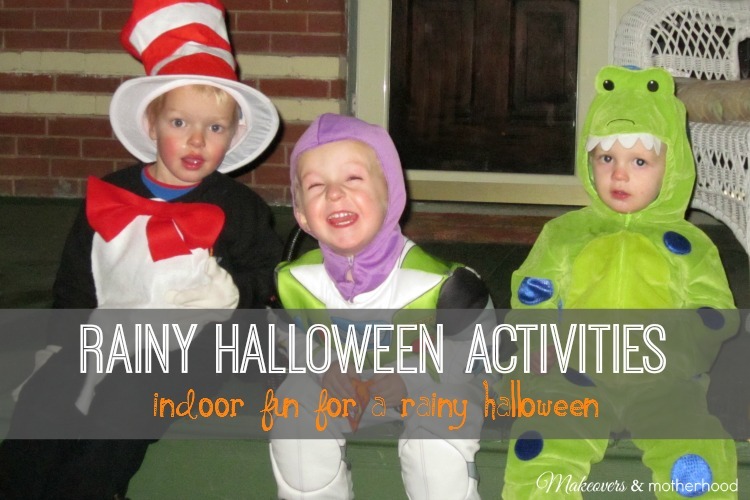 These activities would make a rainy Halloween really fun. What great ideas! We had a rainy Halloween last year and went out with my kids who were 1 and 3 at the time. It was kinda miserable but we made the best of it and didn't need to go to too many houses. Hi Alisha. 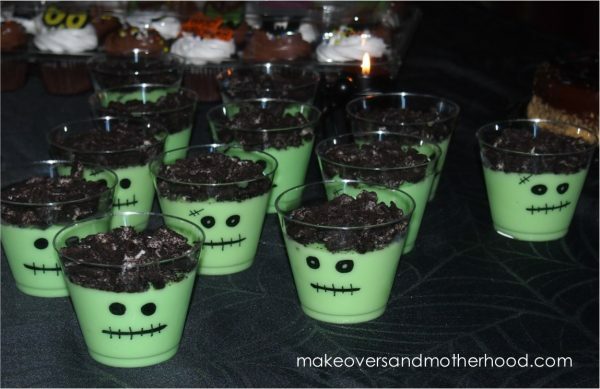 Love your pudding frankenstein cups - adorable! You pose a great question too - what if it does rain! Cute pumpkins are well. I love the web one! Thank you for sharing on our FB page. Pinned! Thanks for pinning! Glad you liked it! Unfortunately, it has rained here all day and the forecast still looks gloomy for this evening. 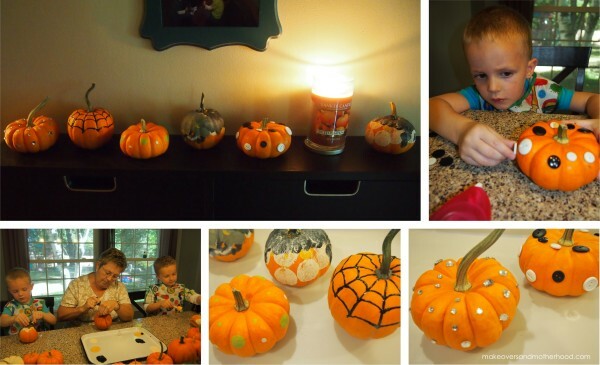 We will be using some of these ideas for an at home Halloween family fun night tonight!